I have been interested in precise timekeeping for a long time, and have run the excellent NTP software on my PCs for several years. Earlier, I had worked with Martin Burnicki of Meinberg on improving the performance of NTP in the Windows environment, however I remained envious of the reported precision of GPS systems with microsecond accuracies. When the low-cost Garmin GPS 18 LVC became available, quite a few people reported using this device with UNIX systems, and this triggered me into purchasing a GPS 18 LVC to see what I could do with it. There is now the even more sensitive GPS 18x LVC available. Initial tests with just the serial 4800 baud NMEA output and no PPS using Windows were disappointing. Whilst the device worked, the accuracy and jitter were no better than could be achieved with a broadband Internet connection and servers from the NTP pool. Realising that I had a spare old 133MHz PC, and hearing that UNIX could run on such a system, in January 2006 I decided to rise to the challenge. This note is the result! Although that PC used FreeBSD 5.4 which was the current version available at the time, when the PC finally failed I updated to a new Intel Atom system and Free BSD 8. If you are more into using NTP with Debian Linux, you may find this RJ Systems page of interest. The issues with Windows have now been largely resolved thanks to the enthusiastic and tireless efforts of Dave Hart, so I have now also been able to add precision timekeeping to Windows also using the GPS 18LVC. 1995 PC with 133MHz Pentium processor, 48MB memory, and 10GB ATA disk. Two serial ports (although one would be enough in this application). Top of the line kit in 1995! 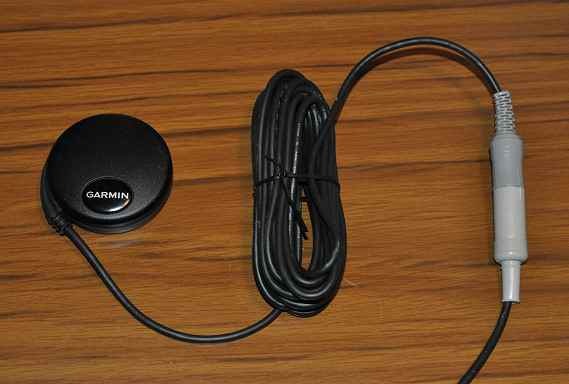 I used the Garmin GPS 18 LVC, which has a cable connection you can wire into your own system. It needs 5V power at 60mA. It should be mounted where it has a clear view of at least 50% of the sky - ideally the whole sky. I tried mine on a window ledge but the more recent windows we had fitted in 2005 do not seem to be transparent to the microwave signals. The GPS is now on a small bracket just outside the window, with the thin aluminium bracket being shaped so that it is clamped by the window. The unit is secured to the bracket by a single screw in the base. 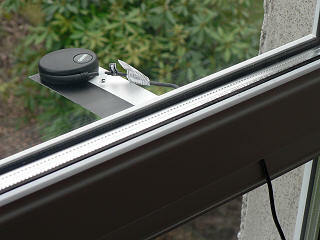 The cable comes through the window and is clamped by the rubber sealing strips - they don't seem to do too much harm. Whilst this worked initially, on 2006 Sep 22 I moved the GPS so that it now has a somewhat fuller view of the sky. How do I know how many GPS satellites are visible? I have written a program called WXtrack which in its registered version has a View, GPS Visibility function which provides a plot of the number of satellites visible versus time of day. You can select a threshold angle and the quadrants visible from your location. For best accuracy, be sure to download the current Kepler data. Tony: "I got hold of one of these, and after much mucking around, it seems to work. (it's defaulted to startup in binary mode and no linux drivers can understand that, so you have to switch it into NMEA using the Windows config program, then switch binary mode off using a command from the spec sheet... the second step doesn't seem to be documented elsewhere)." Me: "My GPS 18 LVC powered up in the correct mode (I think), but the Windows control program wouldn't talk to it. HyperTerminal saw the sentences correctly, though! I wrote a small piece of software to switch it to 19200 baud, and back to 4800 baud, and it's OK now." Tony: "Mine was the other way around - the Windows control program could see it but all hyperterminal (or minicom) could see was binary junk. Had to switch it manually using $PGRMC1... you first get the windows program to enable text mode (forcing 'enable NMEA mode' does this) then quit it and start minicom, and issue a $PGRMC1 with 1 as the second digit (disable binary phase)." For a long while after I first started the GPS it didn't report a sensible position. I suspect it was taking a long time to read the almanac, and then to find the correct satellites. It did eventually sort itself out, but only after about 30 minutes of exposure to a good fraction of clear sky. The unit is quite a bit less sensitive than some of my other GPS devices, which have an add-on active antenna. On 2006 June 06, I attempted to set the GPS 18 LVC into 2D mode, which means that it assumes a fixed height and would only need three satellites for a complete fix (as my sensor can only see half the sky). This is done via the $PGRMC statement, setting the first value to "2", and the second to the sensor height in metres. I will see if this makes any difference (I'm also unsure if the command "stuck"). I don't think this made any difference, as I believe it only affects the initial acquisition. The opportunity later arose to put the unit on the slope of the roof, which would mean that it only saw satellites above 25� elevation, but over a 360� degree arc of the sky. This does appear better than the previous 180� arc of about 5� elevation. No longer do I see spikes of invalid GPS data (due to too few satellites), and now the winter is approaching the central heating transients are, perhaps, the cause of worst errors! The Garmin has a 5V power requirement, which I met from a 7805 and a 12V regulated supply already to hand. 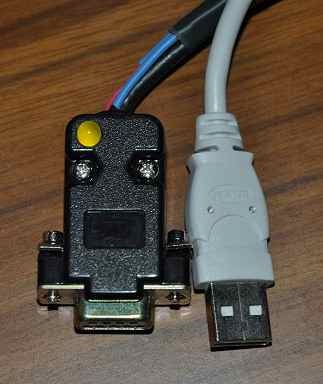 You could, instead, take the 5V from a USB port (see: Terje Mathisens' post). I took this approach when I added a GPS 18x LVC on May 2009. The Garmin TX, RX and ground data connections go to DB-9 RX, TX and ground connections. It may also be that you find two thin black lines in the Garmin cable once you have removed the test header and stripped the cable back for use in your own system, in which case you can connect both lines to signal ground. If someone spots this, could they please check it both thin blacks are connected so that I can report here? The Garmin yellow PPS (pulse per second) line is connected to the DB-9 DCD (pin 1). Mine is also connected to a LED via a 3.3K resistor so that there is a visual indication of the PPS signal. I still see over 4V on of the PPS line. Update: the LED was a little dark, so I changed the resistor to 1.5K and replaced the LED with a special low-current (2mA) one from Maplins. Now easily seen in daylight - I await being dazzled at night! It seems that the GPS 18 has drive capability to support two RS-232 receivers at the same time from the one connection, and I've used this to support a second, parallel-connected PC with just Ground, DCD and TX data from the GPS 18 LVC connected. On a later arrangement, which happened to be with the newer and more sensitive Garmin GPS 18x LVC (note the "x") I used the +5V USB power from the PC to service the needs of the GPS. It's well within the capabilities of the USB port. The GPS went faulty at one stage and had to be returned to Garmin (who replaced it quite quickly - there is a suggestion that it's actually a firmware fault). To avoid the hassle of having to solder the device connections to the RS-232 connector once again, I used a couple of 5-way DIN connectors (not ideal, I know) to connect the new GPS into the old cable, so now I have a 10m lead if I need it! It makes for a very simple and "clean" interface. Although I needed to have the GPS 18 on the roof outside, the GPS 18x is sufficiently sensitive to work indoors (at least on the top storey of the building). If you want a pre-assembled unit with USB power and serial RS-232 connectors, you could try here. Be sure to specify the USB power option. Dave Hart bought and comments: "I've bought two, which were shipped promptly. The USB and GPS cables meet in the DB-9 serial port hood. The fit and finish is good." As noted here, be sure to use firmware version 3.70 (possibly or later). 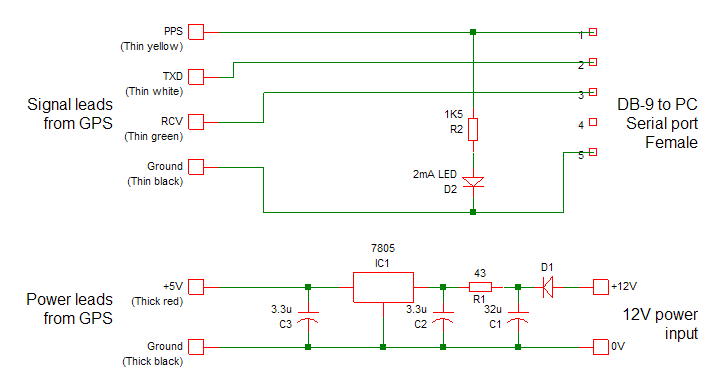 Brian Inglis writes: I simplified the wiring by connecting all +5V power leads to pin 6 DSR. I connect USB power to the DB-9 pins 5/GND and 6/DSR (+5 V) and also connect the GPS GND and power leads to those pins. As the GPS is connected as a DCE (comms/modem) where pin 6 is an output, and the PC as a DTE (terminal/device) where pin 6 is an input, no RS-232 interface should have a problem with +5 V input on DSR. Nice one, Brian! See Wikipedia for a definition of DCE and DTE. The puck and the supplied cable, now terminated in a 5-pin DIN connector, with the other end going off to the PC, reusing the lead from the faulty GPS 18x LVC. I built the yellow PPS LED and resistor into the RS-232 connector. At the time of starting (around 2006) it seemed to be acknowledged that FreeBSD was the best operating system for accurate time keeping, so that's what installed having no other particular preference. Today, Linux may be equally as good - I haven't compared the two. It is also possible to use the same hardware with Linux 2.6, and Philip M White has described how to do this. The FreeBSD formal documentation is here. You can download the BSD 5.4 ISO disk images from here. This is the version which I heard that other people use, and it has worked fine for me. I can't comment from experience if newer versions are any better. You can use the IsoBuster program to extract the floppy disk images from the ISO. You use the fdimage program to make floppy disks to boot from if, like me, your CD-ROM doesn't boot. There is a boot floppy, and two Kernel floppies. There's a fourth fixit floppy, but I didn't appear to need that. When choosing the type of distribution, be sure to install the source so that you can re-compile the Kernel. "I notice that you were unable to boot from CD-ROM, so I thought you might be interested in Smart Boot Manager. I got this several years ago (then as part of Ranish Partition Manager, I think) and it allows me to boot from CD- ROM on my 486, either by installing it onto the HDD, or more usually having SBM on a floppy. I got really fed up with the time it took to use the floppy install method for W2K etc and this solves it quite neatly! Since I wrote my original comments, Ryan Doyle has written up his notes on setting up the Garmin 18 LVC on the (rather more recent) FreeBSD 8.0.
to choose the time-zone, and whether the BIOS clock works in UTC or local time, see the tzsetup command. to edit a file, use "vi" - basic notes are here. To allow remote login via Telnet, need to uncomment the telnet entry in inet.conf. Telnet is only recommended for a small local system with no direct connection to the Internet. To allow root to login via telnet, need to add the word "secure" to the ttyp0 entry in /etc/ttys. Be careful if you enable this option! A handy, free terminal emulator with VT100 etc. capabilities will make editing files easier if you have to work remotely from the FreeBSD box, and I've used Tera Term. Of course, you need to edit the files allowing remote access locally first! PuTTY is a more capable alternative. and recompile the Kernel. On my 133MHz/48MB system this can take several hours. Note the configuration suggestions below before you recompile the kernel. "The idea Harlan Stenn is putting forth is to create a very short kernel config file named PPS containing only those three lines. That way, if you upgrade, any changes in GENERIC will automagically be folded in. I would change one thing. I would change the name of the config file to match the IDENT. It makes it easier to keep track of things." to the end of /etc/devfs.conf, and *sometimes* it looks like those links are not created soon enough in the boot sequence, but it's sporadic and I have not had time to chase it down yet. Well, using PPS_SYNC shouldn't be *required* to use the PPS signal on FreeBSD - what it does is make the kernel discipline the local clock directly from the PPS signal, but FreeBSD also supports the PPSAPI, to let ntpd collect the timestamps from the PPS signal. It should be possible to use this via the ATOM driver. I haven't personally verified any of this though (hence the "should"s) - and I guess PPS_SYNC may give better results, but it could be interesting to try both variants. The device name changed from cuaa to cuad in later versions. http://lists.soekris.com/pipermail/soekris-tech/2005-December/009702.html - "NET4501 and ntp server." What does the fudge line do? the reference ID to the string "PPS"
The latter adjustment does nothing, but had my pulses been the opposite polarity to the ones I actually have, the NTP software might have locked to the trailing edge of the pulse 200ms after the leading edge, and rather than change that in hardware I could have set time1 to +0.200 (or whatever) to get the correct time. Once I had the two Windows PCs working as stratum-1 servers, I could remove one feature I had been slightly unhappy with - that the backup Internet servers were being hit once a minute with the version of NTP and the configuration I had. I decided to replace two of the external Internet servers by the stratum-1 servers on my LAN, and the third external server by another PC on the LAN, providing four total servers (the GPS and three external). These three servers are shown as 192.168.0.1 etc in the configuration file below. This allowed me to reduce the poll interval for the GPS device from 64s to 16s, and gain an improved performance (I hope). list is the history used by the "restrict limited" rate-limiting mechanism. More on the mru list. Here is a graph showing the offset from UTC reported by the PC, with 20�s added so that the offset is positive. (An ideal timekeeper would be a straight line at 20�s). As the offset value reported by NTPQ is only accurate to 1�s, increasing the plotted time resolution would not provide more information. Please remember that this is a lowly 133MHz processor system! How I make these plots. Performance history. All NTP plots. 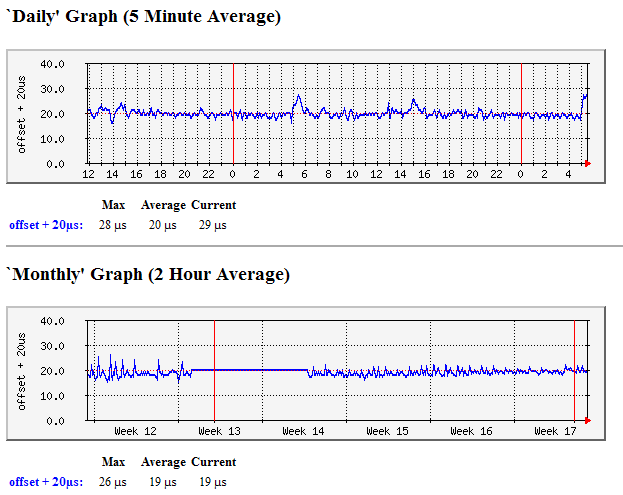 The graph shows the performance up to the point of switch off on 2009 March 24. Multiple Internet servers with Windows NT/XP clients: excursions of the order of 10 - 20ms caused mainly by diurnal temperature variations. The time constant on the NTP correction loop grows quite long to minimise NTP network traffic and load on NTP servers, and the lookup interval typically grows to 1024s. This long time constant allows some drift. Serial GPS source to Windows NT/XP. At the default setting, 4800 baud, each bit occupies 0.2ms, and the uncertainty with which the GPS sends out the data, and the operating system can report the time the data was received, result in a somewhat higher short term offset jitter, and no better daily drift than with multiple Internet sources. You may be able to do better using a high baud rate, and perhaps with a USB-connected GPS and a much higher high baud rate. It's possible that the jitter would be less with a UNIX system, but I've not tested that. Serial source to Windows XP or Windows-7/32/64 with PPS support. This provides some 250�s of offset jitter, which is a lot better than having just the serial input, but not as good as a FreeBSD system. Performance graphs here. PPS source to FreeBSD, with PPS_SYNC support in the kernel. Even on a lowly 133MHz PC, with a GPS antenna seeing less than half of the sky, 10�s offset jitter is achieved. After several years of faultless active service from January 2006, this system was retired on 2009 March 24, as satisfactory performance had been obtained from a Windows system running a serial GPS NMEA port and a special serialpps.sys serial port drive with the ATOM reference clock. However, now that I have a second GPS 18 LVC (actually an 18x), so I have three NMEA/PPS signals available with parallel connecting one GPS, in March 2010 I decided to resurrect the FreeBSD box to have even better timekeeping performance, however its PSU failed on Monday, March 29, so I am temporarily without a FreeBSD box. In April 2010 I replaced the old Intel Pentium 133Mhz box with a shiny new Intel Atom system, which runs at such low power that it doesn't need any cooling fan. The fun to be had getting the box to dual-boot FreeBSD and Windows is described below. Even more fun in this application was that the wire connecting to pin 1 of the serial port was broken at the RS-232 end of the header cable. It took some time to find that one! Current performance is shown here, and a snapshot of the kernel variables shows the following. (With later NTP versions you may need the command: ntpq -c kern <server>). Note that there are calibration errors, but they don't change in number. On the later Intel Atom system I was initially concerned to see 25 calibration errors after a reboot, but the count was the same days later. As I now have a couple of stratum-1 servers based on Windows, the configuration file for PC Pixie is a little different. It may also be that the NTP ntpd 4.2.4p5-a (1) installed with the later FreeBSD 8.0 distribution would allow more flexibility. 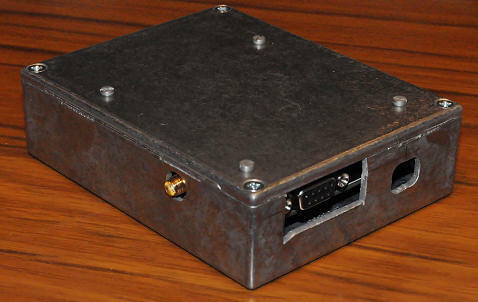 It has three sets of entries, the first for the GPS/PPS stratum-1 server with details similar to those listed above, the second is a set of three lines for external Internet servers from the UK pool, where both minpoll and maxpoll are set to 10 (1024 seconds) so that minimum use is made of those servers, and finally a third set for the two local stratum-1 servers polled at 64 second intervals. These last two are probably superfluous, but don't seem to do any harm; 32 seconds is the remote poll interval I use for LAN-synced PCs. At the left-hand side of the Monthly graph, you can see a few days of data from the earlier FreeBSD system. which shows rather more daily variation than does the current system. This improved performance is also reflected in the daily data. However, it shows that even a lowly 133MHz/48MB Pentium system is quite up to the NTP task. The current data may be seen here. If you are using a Garmin GPS 18x LVC, be sure to use firmware either 3.20 or before, or 3.70, as there is a problem with some versions of the firmware where the NMEA data can be more that one second late compared to the PPS pulse, and hence present the incorrect time information to NTP. The problem, and my flawed attempts to analyse it, and a working solution are described here. Note that there is also an issue with some 3.x firmware which causes the device to stop working and appear bricked. As mentioned above, this is well documented on Ryan Doyle's site although I stuck with the default shell and with the VI editor - these notes on vi are helpful for the novice or occasional user. I bought a pre-assembled ITX system from ITX Warehouse in the UK, who provided me with a W71 system built into a W42 box as that has the serial port on the rear of the case. The main board is an Intel Desktop Board D410PT. You will need to recompile the kernel to add PPS support. Follow the steps suggested by Harlan Stenn above. Allow an hour or two. You may need to log out and back in at this point, before running portmaster. to get either the current release version, or the current development version. The portmaster step takes about 5 minutes on my Intel Atom PC. After updating to the release version (4.2.6p5@1.2349), the "*" tally code in "ntpq -p" changed to "o", the normal indication that PPS support was enabled. After updating to the development version, the command "ntpq -c kern pixie" returned the kernel information correctly from the remote PC. You may want to take a backup copy of the current working files first! Chuck Swiger has kindly mentioned: FreeBSD port-management tools like portmaster and portupgrade can download and install precompiled packages instead, if you tell them to (see the -P flag). Thanks, Chuck, that should help speed things up if a precompiled is available. You don't need to wait until someone else updates portmaster. Just update the port to the current version of ntp-devel. Doing so usually works unless there is a significant enough change in the port codebase to "break" the port. You can then follow the same sequence of commands as above to replace the current NTP binaries with the ones you have just compiled. The portmaster step takes about 5 minutes on my Intel Atom PC. I know you may ask why, but as I am more familiar with Windows it was easier for me to set up the system using Windows-7 to start with, just to be sure that all the hardware was present and intact. When setting up the box, which has no CD/DVD drive, getting FreeBSD to dual boot with Windows-7 was "fun". I ended up installing FreeBSD 8.0 first, from DVD using a borrowed SATA drive (I've now bought one for such purposes). Once Windows-7 was installed, nothing else would boot, but by using EasyBCD I could get a new entry in the boot menu for FreeBSD. Would it boot? No, it would not! There appeared to be two issues - the file name wasn't correct - FreeBSD has a file named boot1 (which is on the installation DVD), but EasyBCD insisted on calling it something different. Easy solution, copy boot1 to the file name it expected! Still didn't work, and I suspect this was due to the file being in a sub-directory created by EasyBCD. Solution, use the Windows-7 BCDedit command to say that the file was in the root directory, and move it there as well. A program which I found later and which appears more versatile is PuTTY. As I now have two Windows PCs also running as stratum-1 servers, I have a slightly different configuration file, but I have still kept it simple. I note that FreeBSD 8.0 stores the drift file in a different location. #   refid = text string to define the reference as ".PPS." I find it amazing that these so-called install routines actually appear to involve recompiling the software from scratch, so that should take a few seconds turns into a 30-minute job. Some experiments using the Sure Electronics GPS evaluation board are described in more detail here. Note the very bright blue Pulse Per Second LED! rusty - that's just the lighting. I received much help from the kind folk in the comp.protocols.time.ntp newsgroup including Terje Mathisen, John Pettitt, Dave Hart, Steve Sommars and Harlan Stenn. Thanks, guys! For the FreeBSD 8.0 install Ryan Doyle's notes helped a lot.